Make plans for Sunday, April 29 at 3 p.m. to hear the Elmhurst Choral Union and Orchestra present American Voices. This concert features prose written by some of America’s best-loved poets and authors, set to music by American composers. Elmhurst Choral Union: American Voices will be backed by a full, professional orchestra and held in Elmhurst College’s stately Hammerschmidt Memorial Chapel. At Elmhurst Toyota, we enjoy Elmhurst Choral Union concerts and look forward to hearing this one in Hammerschmidt Memorial Chapel, which has marvelous acoustics. We encourage you to attend too. At Elmhurst Choral Union: American Voices, you’ll hear the words of Walt Whitman, Robert Frost, Thomas Jefferson and others set to music. Composers whose songs are featured in the concert include Howard Hanson, Aaron Copland, Morten Lauridsen, Eric Whitacre and Randall Thompson. The composers were inspired to take the writing of American authors and set it to music in the tradition of American folk songs. You’ll hear Randall Thompson’s “Frostiana” and “The Testament of Freedom,” Howard Hanson’s “Song of America” and many others. The orchestra providing this beautiful music is directed by conductor Scott Uddenberg. The Elmhurst Choral Union has been part of our community since 1952. Originally open only to Elmhurst College students and faculty, any talented singers can now audition for a place in the chorus. 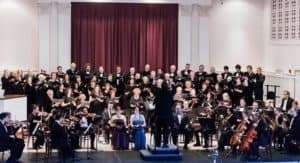 The Elmhurst Choral Union performs several concerts every year that feature recent compositions, popular choral standards and rare works by a variety of composers. Tickets may be purchased online at www.elmhurstchoralunion.org/tickets, by phone at 800-838-3006 or at the door starting at 2:15 on the day of the concert. Please note that tickets purchased at the door must be paid by cash or check. Call 630-758-1100, email info@elmhurstchoralunion.orgor visit the website at www.elmhurstchoralunion.org.